I have more than 30 years of experience dealing with commercial work and commercial property transactions. The length of time I have spent in the profession has given me an excellent understanding of how best to tailor advice to best meet the needs of different clients. I have extensive experience advising clients on all aspects of commercial property transactions, including advising Landlords and Tenants in complex site assembly and developments. I also have considerable expertise in residential property matters. 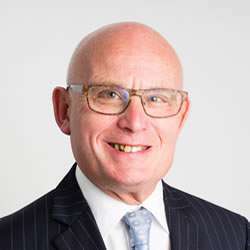 My knowledge of commercial matters extends to advising on share sales and purchases and I also have expertise in handling professional negligence matters, with a particular interest in representing clients in claims against solicitors. I previously obtained a degree in commerce before qualifying as a solicitor. I joined from a City law firm in 1974 and became a Partner in 1976. Acting for a developer on formulation of option agreements and exercise of options on larger residential development site. The site was disposed of in excess of £2million. Acting for an educational institution on the lease of a building at rent of over £1.5million a year. Acting for all the flat owners in a block of flats as they entered into a conditional contract with the developer. Acting for a Bank on a £5million loan secured on investment properties. Acting on prospect aspects of sales of two companies for in excess of £5million and £4million respectively. I am married with two grown-up children. I am actively involved in various communal activities and also enjoy gardening and walking.